Credited with setting up Duluth’s first sawmill in Oneota in 1856, Henry Wheeler also quarried the first brownstone from Fond du Lac, using the stone as the foundation of his sawmill’s boiler/engine house, and some Fond du Lac brownstone was used in the Minnesota Point Lighthouse in 1858. 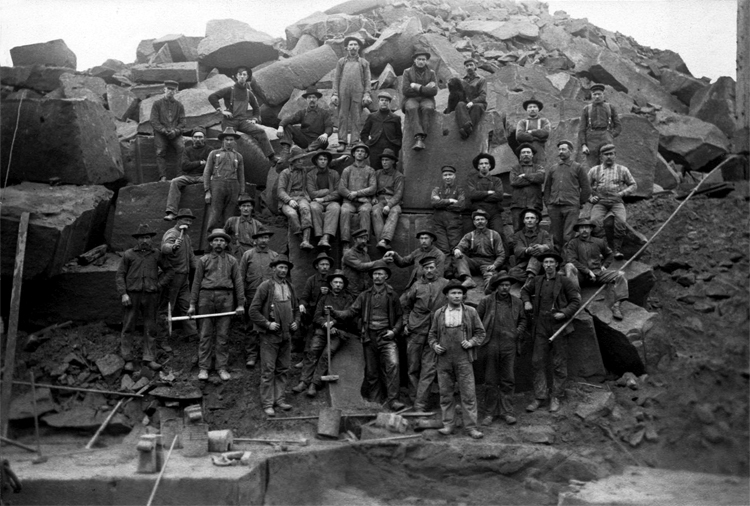 But as an industry, brownstone quarrying would not take off until the 1870s, when the rest of Duluth did. It reached its peak in the late 1880s and by the time the industry had played out in 1910, Fond du Lac brownstone was in use in buildings from New York to Omaha, but primarily in Chicago. Lumberman Edmund Ingalls first came to the region in 1861 to establish a sawmill and set up a logging operation. By 1870 his attention had turned to brownstone, naturally formed sandstone found in a variety of colors from reds to yellows that came to popularity in the latter half of the nineteenth century with the rise of Richardsonian Romanesque architecture. In 1869 Ingalls purchased Durfee’s Farm, a sixty-three acre lot on the Wisconsin side of the St. Louis River at Fond du Lac. A year later the site was known as Ingalls Quarry and featured a bluff fifty feet high and up to four hundred feet deep. It would become the region’s most productive quarry, but not under Ingalls’ watch. Described by one historian as an intelligent businessman (but one who “did not regard an obligation or his word as of any value”), Ingalls left Duluth after the financial panic of 1873 and in 1879 leased operation to Nils Nelson. By 1885 Ingalls had returned to the Zenith City and traded his property with that of A. M. Miller, who turned quarry management over to John H. Crowley. Ingalls remained active in Duluth business until his death in 1895. The summer of 1879 saw a surge in business for the Ingalls Quarry, winning a fifteen-year contract to build St. Paul’s Union Depot; the agreement demanded twenty thousand tons of brownstone per year. Local buildings constructed with stone from the Ingalls Quarry (sometimes called the “Crowley Quarry”) included the Clark Block, the H. F. Williamson Block, the Costello Building, the Ingalls Block, the C. H. Oppel Block, the Pastoret-Stenson Block, the American Exchange Building, Duluth National Bank, the Guilford Hartley House, and the John Erickson House, all of which have been destroyed. The only buildings featuring Ingalls/Crowley brownstone that remain standing in Duluth are the Hunter Block and Wirth Block. The press also lauded the news that Krause would take over sole operation of the quarry, describing him as “a substantial and reliable man.” The Krause Quarry quickly gained a reputation as producing the area’s best stone, and the quarry operated steadily until the industry’s demise. While most of it was shipped for use outside the region, Krause Quarry stone was incorporated in Duluth’s first Board of Trade Building and Marinette Iron Works, both of which have been destroyed. Krause and his wife lived out their lives as celebrated citizens of Fond du Lac, where he died in 1937. Duluth’s last quarryman was hardly a quarryman at all, but an Irish auctioneer transplanted from St. Paul. In 1869 Michael Chambers purchased property in Fond du Lac known as Colonel Carlton’s Farm, which included a plum orchard and, conveniently, a brownstone quarry. Chambers Quarry would utilize the coming Lake Superior & Mississippi Railroad to help transport its stone, described as “dark chocolate” in color. Along with the rest of the country, Chambers panicked with the financial crisis of 1873. He posted an ad to sell his quarry but received no offers. Four years later he threatened to tear down his home rather than pay property taxes, and he skipped town in 1879. The cantankerous Martin Boyle took charge of the operation in Chambers’ absence. Chambers was essentially out of the brownstone game until his death in 1895. Duluth landmarks constructed with Fond du Lac brownstone included the Banning & Branch Block, the Grand Opera House, the Spalding Hotel, Franklin School, and Duluth Brewing & Malting. The 1888 City Hall and the Jail next door, Fire Hall Number 1, and portions of Fitger’s Brewery Complex are the only examples of the stone’s use in buildings still standing in Duluth. By 1910, all Duluth quarries had ceased production.